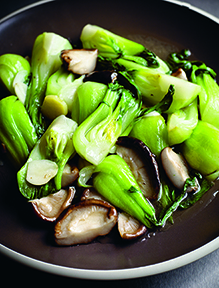 Shiitake mushrooms, commonly known in Chinese as “fragrant mushrooms,” have a rich, savory flavor that can enhance the taste of other foods, such as the fresh bok choy in this recipe. For an even more intense flavor, use dried shiitake mushrooms, which should be soaked in hot water for 30 minutes to soften. Rinse them, cover with fresh water, bring to a boil and simmer for at least 20 minutes with a dash of Shaoxing wine, some crushed ginger and spring onion and salt to taste. Leave them to steep in the liquid until you want them. Reprinted from Every Grain of Rice: Simple Chinese Home Cooking* by Fuchsia Dunlop. Copyright © 2012 by Fuchsia Dunlop. Photographs copyright © 2012 by Chris Terry. With the permission of the publisher, W.W. Norton & Company. All rights reserved. Wash the bok choy, then cut each head lengthways into quarters. Slice off and discard the mushroom stalks and halve the caps. Combine the sugar with the potato flour mixture. Bring some water to a boil in a saucepan (1 quart/1 liter will do), add 1/2 teaspoon salt and 1/2 tablespoon oil, then blanch the bok choy and mushrooms briefly, just until the bok choy leaves have wilted. Drain and shake dry. Add the remaining 3 tablespoons of oil to a seasoned wok over a high flame, swirl it around, then add the garlic and ginger and stir a few times until you can smell their fragrances. Add the blanched mushrooms and bok choy and stir a few times. Finally, add the potato flour, mixture with salt to taste, give everything a good stir and serve. Variations: The same method can be used to cook all kinds of greens, including choy sum (cut into chopstickable sections), baby bok choy, Shanghai green bok choy, or Chinese leaf cabbage (cut into thick slices).